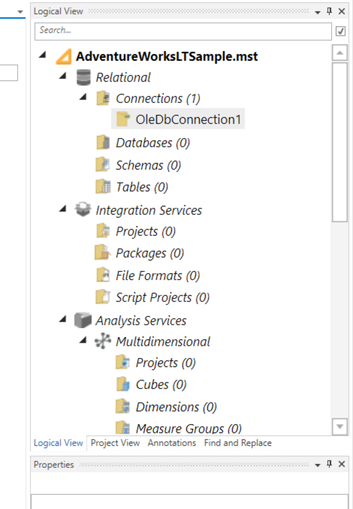 In BimlStudio, connections are defined once in a project and shared with all the objects that need to reference them. This allows you to easily update connections in a single location. Go to the Home tab on the ribbon, and click the Connection button. The Connection button is a split button. Clicking the top half will create a new OLE DB connection, and clicking the bottom half will list all the available connection types. 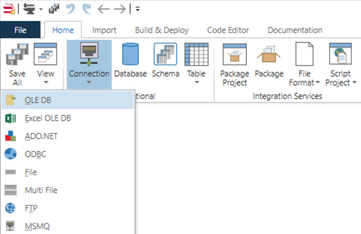 Click the OLE DB menu item to create an OLE DB Connection. When the connection is created, it will appear in the Logical View under Connections. The connection designer should be open on the right, if not Double-click on the connection to open the designer for it. Save the project to persist your changes to the project files. See Saving a Project for more information. Once you've entered a connection string, you can click the Test button in the Connection Tools. Connections tab in order to validate it. 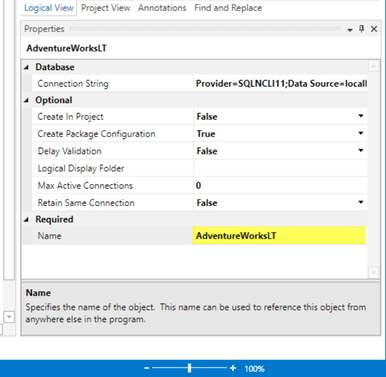 The connection string in the example above allows you to connect to the AdventureWorksLT database running on your local computer, using your Windows credentials. 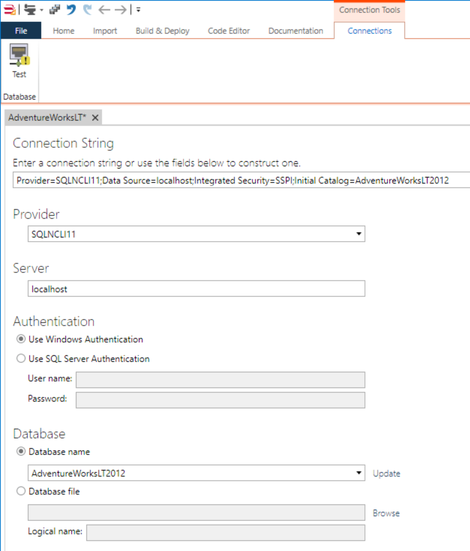 You will need to alter the connection string if you are using another server or a different authentication method. http://connectionstrings.com is a good website to determine what type of connection string you should use for various database systems. If you right click the connection and click View Biml it should look similar to the following snippet.